Whether you’re a paramedic, firefighter, Garda, GP, midwife or social worker, involvement with a sudden child death can be incomprehensible and can cause you to question your professional capacity and extent to which you should get involved with the bereaved family. There are no set guidelines as to how much you should be involved or what you should say to a bereaved family, but there are a few things that you can do that will make a world of difference to someone coping with the sudden loss of a child. Most importantly, make contact, don’t avoid it. When hearing of a bereavement many people including friends and relatives stay away, so even a two-minute call will be appreciated. You don’t need a counselling qualification or special training, just a good ear. Say how sorry you are. Ask if there is anything you can help with immediately according to your professional capacity. Check they have information about FirstLight, especially the 24/7 Emergency Support number 1850 391 391. Use any clichéd expressions of condolences such as ‘time’s a great healer’ etc. Ask them to repeat the story unless they are eager to do so. Become defensive of your own or any colleague’s practice. Speculate about anything you’re not completely sure about. Compare it to another case. 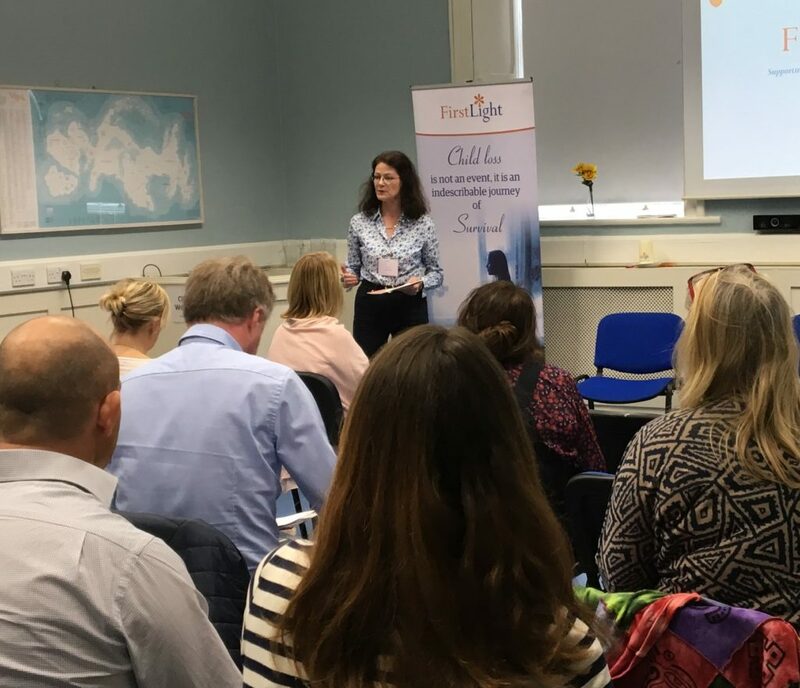 A unique feature of our training is that it is designed and delivered by professional and qualified staff who work directly for FirstLight and contribute to all the services we offer, and who can, therefore, draw on their own experience of working with suddenly bereaved parents and families. We blend theory with practice in our training, ensuring that those attending will leave with practical, creative ideas to implement within their professionals roles. This ensures that our training days are clinically based. Delegates will have an interactive training experience using a wide range of teaching methods and will go away with practical ideas for working alongside bereaved parents and families. These workshops offer help to members of front line health professions, e.g. Gardaí, Funeral Directors and many other professions who come into contact with suddenly bereaved parents and families. If you would like a FirstLight Speaker to attend your conference or event, please contact us to discuss in more detail.